Wow, April is already here and it is hard to believe spring is already in the air. There is increased precipitation this month which means bring out the umbrellas, raincoats, and goulashes. April 2nd – there is an extra bonus holiday with National Peanut Butter and Jelly Day and Reconciliation Day. So go ahead make yourself a sandwich and reach that resolution you have been postponing. April 5th – Go for Broke Day. Perfect excuse to try your luck or bust playing bingo today! April 6th – Sorry Charlie Day. Go ahead and pick up that phone and tell that special someone you are sorry. April 14th - International Moment of Laughter Day. Hey, a good laugh a day does the soul good don’t you know. April 15th - Titanic Remembrance Day. Ah, a sad day indeed. April 20th - National High Five Day. Raise that arm up and slap palms with everyone you see! April 23rd – Lover’s Day. Oo la, la have wild rendezvous with that special someone. April 23rd - Take a Chance Day. Head back to the bingo rooms and purchase the max tickets allowable. April 28th Kiss Your Mate Day – plant a wet one on your sweetheart. April 30th - National Honesty Day – Tell the truth and confess that white lie you told. 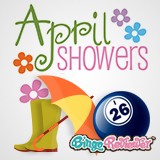 And if you are not in the mood to dodge raindrops this month then you know what to do! Bingo baby bingo!